DIY wall decor ideas are cheap and creative alternative ways of blank wall decoration. Simple and cheap craft ideas and easy diy wall decoration projects add interest to empty walls while helping to declutter your interiors and save money on home decorations. Crafts and DIY wall decorations can cost practically nothing enhancing interior decorating in eco style with recycled crafts. Mirrors, posters and wall art are not your only options when it comes to filling a bare space and decorating empty walls. Handmade wall decorations add style and personality to interior decorating and staging home interiors at no cost. Painted on wood animal silhouettes look fantastic, neutral and attractive. Whether it is birds images, butterflies decorations or a deer head silhouette, these simple painting ideas look fabulous on a rustic mantle or hanging on empty walls. Nature inspired designs make any room look alive and pleasant. Large colorful books and their artistic combinations create amazing wall decorations also, offering cheap ideas for interior decorating and staging home interiors. Velcro, glue and scissors are all you need for your unique diy wall decoration project that turns a favorite book collection into a cool wall art installation. 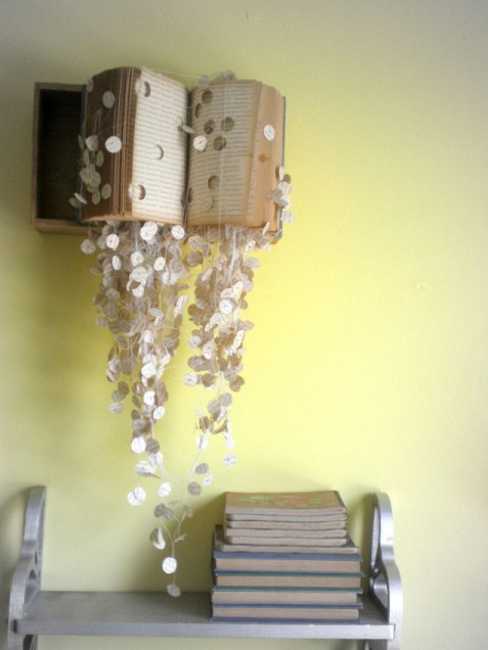 These cheap ideas with books are perfect for home library and office decor. Abstract painting ideas and geometric shapes are modern trends in decorating or staging home interiors. 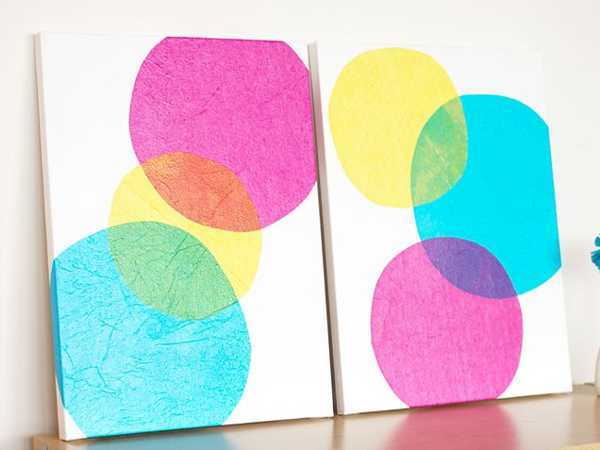 Tissue paper adds texture and interest to diy painting ideas and creative wall decorations. Gently sketch out your designs on the tissue paper. Cut them out. Paint the canvas white, and let dry. Arrange the tissue paper elements layering them a bit for creating interesting geometric designs or abstract wall decorations. Secure the elements down and let dry. Make few canvas art works for your wall decor, then hang them or place them on an accent table and prop against the wall. 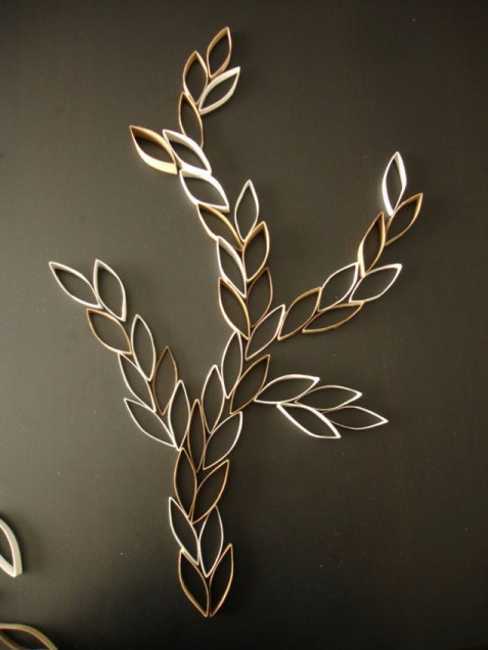 Twigs are a beautiful material for crafts and diy wall decoration projects. Twig antlers look ingenious, offering universally appealing and cheap ideas for wall decoration and creating pleasant and distinctive focal points for stress-free interior decorating or staging your home for sale. Lovely branches with leaves made with used toilet paper rolls create wonderful wall decorations that look striking on dark painted surfaces. Floral designs and leaf patterns are delicate and earthy. Made of recycled toilet paper rolls, the wall decorations are excellent for inexpensive interior decorating or staging home interiors in eco style. Doily adorned wall decorations made of wooden or plastic embroidery hoops in various sizes are great craft ideas for inexpensive wall decoration. Crochet patterns and knitted items are modern trends in decorating that bring warmth into home interiors and create a charming look.